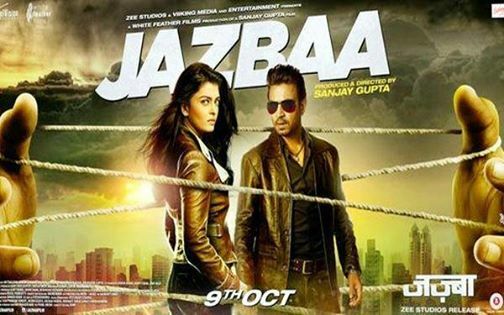 Jazbaa is one of those run of the mill products that you won't remember even after a month. Clearly, this film wasn't made without any Jazbaa. Not that I had any expectations from Sanjay Gupta, whose trademark style is Gangster-Violence-Smoke-Tashan-Cacophony. I was hopeful, may be he made some effort for this one. It was touted to be the comeback movie of Aishwarya after a hiatus of 5 years after Guzaarish. As expected, neitherSanjay nor Aishwarya have changed much.. still pathetic! Even, the suspense in movie was cliched something that we have already seen. Aishwarya has always been known for her barbie doll plastic image and poker face sans any emotions. In this film, she has taken the other extreme of being hyperactive. You'll find her shouting through out the movie. May be she has been watching too much of Kekta Kapoor's serials all this while. Jazbaa would be the first film, where 2 of my most respected actors (Irrfan and Shabana Ji) have disappointed me. Both of them chose a role, which didn't have any juice. Even, Atul Kulkarni and Siddhanth Kapoor didn't get much screen time. It would be interesting to find out whether heavy duty chopping was done in editing or the script was conceptually written only for Aishwarya's character. Total run time for the movie is 2 hours. May be director should have done away with all the songs, which don't fit in such a fast paced story. Some time could have been spent in character sketch of Yohan (Irrfan's character). What is his equation with Aishwarya's character? Whether Yohan is an efficient and practical officer OR good for nothing corrupt policeman. Also, the suspense should have been revealed a little earlier and antagonist should have been given some screen time to impress audience. Music is extremely boring though well timed. It gave me ample time for loo breaks and popcorn breaks. Verdict: It is one of those movies, which should be skipped at all cost.